There is a lot of negative stigma surrounding the idea of dating someone who is in a wheelchair. But in reality, people who use mobility devices are no different from anyone else. Yes, there are minor considerations to planning a location, but that’s about it. That seems so minimal in the long run. Does it really make a difference that you have to call ahead and find out if a restaurant is accessible for your date? No. There are so many benefits to dating someone in a wheelchair that people look right over. One of the benefits is that these individuals have so much love they want to share. They are looking for their compatible partner, the same way that you are. They want to find someone special, who can see past the chair they are confined to. They want someone to laugh with and watch movies with. They want someone to cuddle with on a cold night. It’s not different from your wants, or the wants of anyone else you could be dating. Most mobility device users are fiercely independent, as well. This means that you won’t find yourself in a relationship with someone who is clingy or overly reliant on you. You may have misconceptions that suggest you need to take care of someone in who is restricted. This isn’t true. You may want to take care of your partner, but they will never expect you to. They want to demonstrate that they are strong and capable of taking care of themselves. That’s all. You’ll benefit from this because they will be more appreciative of your help than anyone else. Along with independence and an outpouring of love, mobility device users are extremely patient. This has come from both training and acceptance of their circumstances. They can exhibit an understanding where anyone else might not be able to. Whether that’s about your emotions or your insecurities or anything else. They will be more accepting of your limitations, as well. You don’t have to worry about trying to be something you’re not. 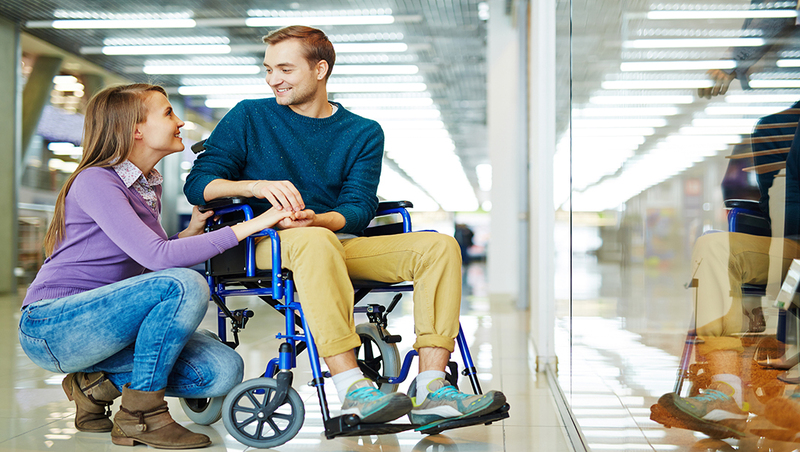 You can be more comfortable around a wheelchair user. There are some other perks, if you want to be brutally honest. There are parking benefits to dating someone in a wheelchair. There are shorter wait times at amusement parks and concerts. But, little things like that are just icing on the cake of a very beneficial relationship. You wouldn’t want to date someone specifically for those perks because that would be awful. But, if you’re already interested in someone who uses a mobility device, those perks can be fun. They can be exciting. In fact, your whole relationship can be exciting. You may learn things about yourself that you never knew. You may challenge your view points. You may challenge the social acceptance of people who use mobility devices. You may also challenge your own comfort levels and undo the social stigma around dating someone in a wheelchair. When you think about the benefits versus the work required to build a healthy relationship, there’s no contest. There isn’t much of a difference between dating a wheelchair user and dating someone who is considered able-bodied. It’s all in how you choose to look at the relationship.